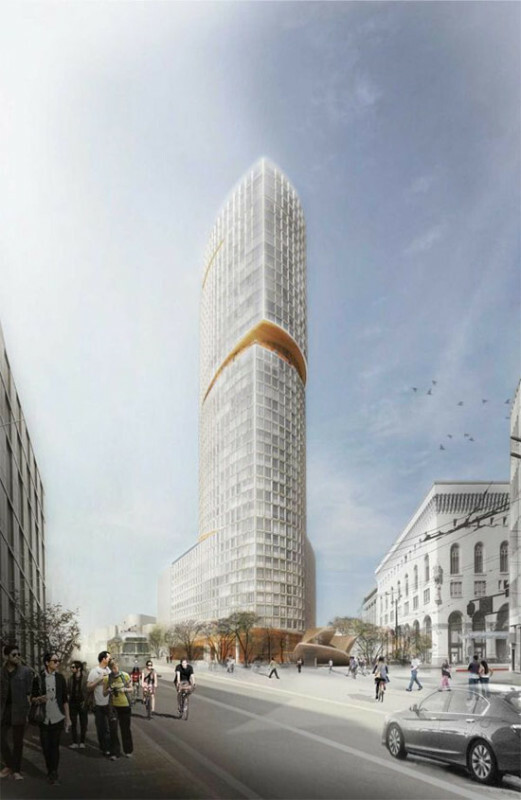 The momentum continues in San Francisco for the Norwegian firm Snøhetta with a recently-unveiled tower at the corner of the city’s Market Street and Van Ness Avenue. And the project has been garnering some fairly untraditional responses from citizens. 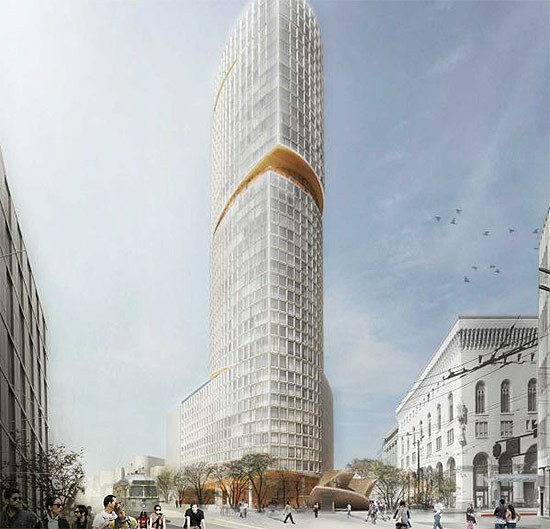 As proposed, the curving, 37-story One Van Ness tower would be divided by three large cuts, designed to lessen wind load and provide new common spaces. 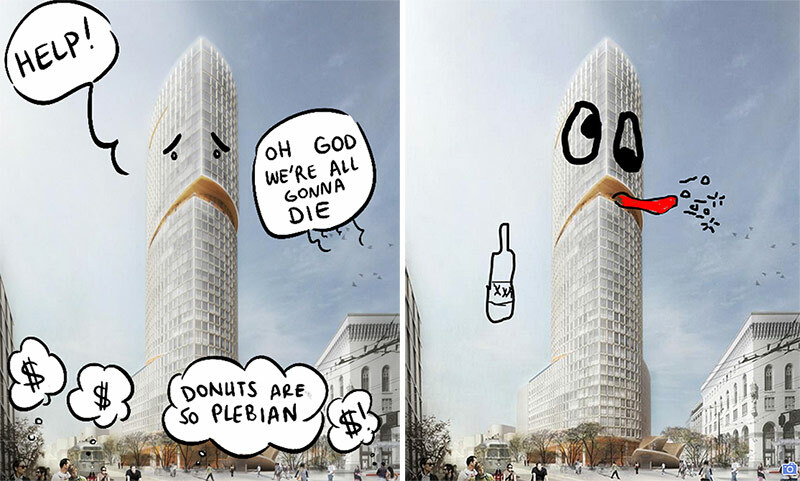 Paired with SCB, Snøhetta will work to replace a tower originally proposed on the site by Richard Meier and Partners. The building’s carved-out center has also provided inspiration for illustrators to poke fun. Illustrator Susie Cagle, who told CityLab that the design reminded her of the last SF boom’s “bubble mentality,” drew the distressed building on the left, while Twitter user The Tens seems to think the building doesn’t much care for its neighborhood, as demonstrated in the image below right. 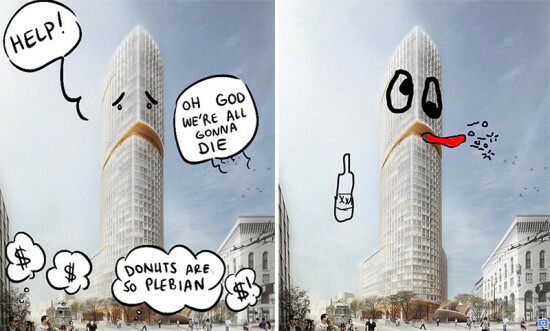 San Francisco Chronicle architecture critic John King took note of the parodies and dubbed theSnøhetta’s creation the “Talking Tower.” He was quick to add in another tweet that the impromptu naming was “not a critique”—he says he quite likes the tower. AN recently talked to Snøhetta principal Craig Dykers about his firm’s continuing success in San Francisco, including an extension to SFMOMA, a consulting role on the (recently revised, and moved) Golden State Warriors Arena and a (ultimately unsuccessful) shortlisting for the Presidio Parklands.